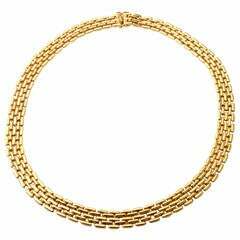 Wonderfully wearable 18 karat gold necklace of five rows of long oval links. It measures 17 1/2" long and 7/16" wide. Eighteen karat gold; excellent condition. 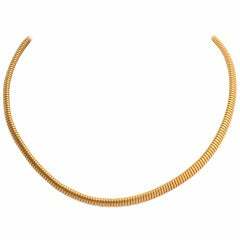 Flexible gold tubogas necklace that can be worn equally well on its own or with a pendant. Measurements are 16 1/2" long and 3/8" wide.